Advanced training integration provides in-context training for team members. Team members can stay up-to-speed on security concepts and best practice implementations as they are needed for their project work. When you perform ALM integration, your ALM of choice can synchronize with training content from SD Elements. You can access those training modules directly from your ALM to complete any course you like on SD Elements and track your progress. 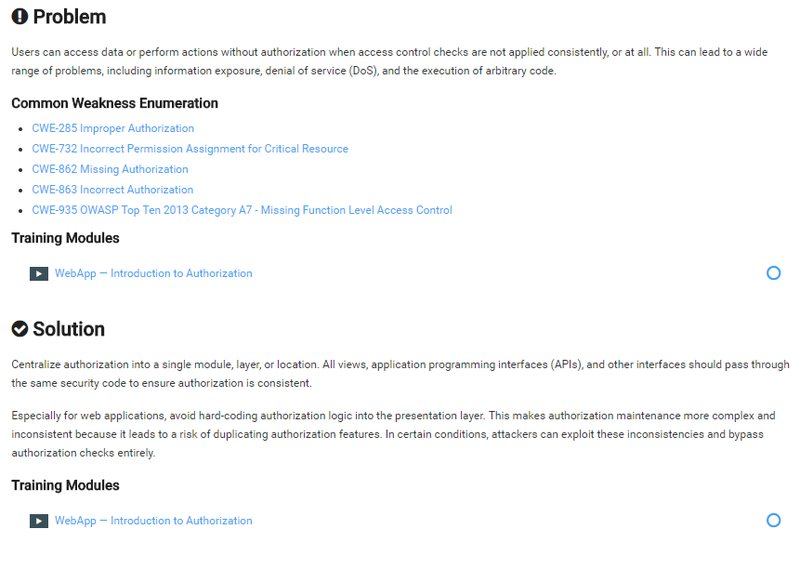 Advanced training integration requires additional licensing and configuration. Reach out to your sales support representative for more information. SD Elements provides in-app training covering various programming languages and key security concepts. Training links are marked with the school icon. Examples of integrated training links are provided below. Monitor the training progress of team members by following the steps below. The user has the permission Global Roles → User Management → Manage Users & Groups. Under the Reporting menu, select Training Report. A report file is downloaded in CSV format. The file contains the list of team members and whether a training module was completed.